Interview With Giulio Bettio, Lattonedil Spa Milan Group | Saip S.u.r.l. When you are lucky enough to interview someone like Giulio Bettio, who has grown up in his company and who has been sharing its projects, challenges and dreams since he was young, then the interview becomes a life story, a colour film and all you need to do is relax and enjoy it. Giulio Bettio is the owner and CEO of Lattonedil spa Milano, one of the most important manufacturers of sandwich panels in Europe. The group is based in Carimate, a few kilometres away from Como and Milan, in the heart of Brianza, a land rich in ingenuity and talent characterised by strong work ethics regarded as a social value. The first company of the group was founded here in 1969, almost 50 years ago. Today, Lattonedil has 10 production districts located throughout Europe: six in Italy, one in Germany, one in Spain, one in Bosnia and Herzegovina and a new office about to open in France. With an annual turnover of 220m euros* (*consolidated data for 2017) and a wide range of products, Lattonedil – whose products are also highly appreciated abroad – truly stands out in the Italian manufacturing industry. The site of Carimate, the headquarters of the Group, in the Seveso river valley cover over 120,000 sqm (15,000 of which roofed) occupied by 3 production lines, offices and external storage areas. The facility closed the past year with a turnover of 136m euro. Carimate, the production plant and administrative Headquarters. Dr. Bettio how was the Lattonedil group established? "The story of Lattonedil begins with my two older brothers, Ettore and Giovanni, who, in the 60s, worked as tinsmiths in a local construction company. They mounted roofing, drainpipes and did various maintenance jobs. In 1969 they decided to start their own business and, within a few years, as work kept increasing, they bought their first warehouse and new machinery. Although I was still young and still went to school, I was very interested in what my brothers did, certain that soon I too would have taken part in that adventure. I finally joined the company in 1977. I was the fourth brother to enter, soon followed by my youngest brother. From 1975 to 1990, the business mainly focused on construction work and drainpipe manufacturing. As work increased, we realised that our industry was undergoing a major change, something new was revolutionising how industrial warehouses were built. The panel was beginning to be noticed on the market. Our customers wanted panels to cover roofs, they increasingly kept asking for them. So, with the aim of providing our customers with an additional service, we started purchasing them and offering them. Obviously we were still installing them as well. It was immediately a great success, a success that while continuing, at a certain point, forced us to make a choice that would radically transform our business. Indeed, our suppliers were no longer able to meet the large demand for panels we required within reasonable times. Customers had, and still have, the need to optimise the schedule of construction sites and to have the necessary material available. We wanted to guarantee this service. Therefore, around 1992, we began to seriously consider the idea of producing our own roofing panels: halving delivery times would have been a competitive factor for both us and our customers. That year we installed the first production line, and the following year, 1993, our first line went into operation. Our world had changed: the traditional jobs that my brothers had always done were replaced by new jobs that, in turn, were replaced by others...... where would all this lead us? Signs of further change soon appeared: next to the standard product, custom products were requested and created, with very precise specifications provided by customers. In some cases, the customer chose to perform installation on their own. We worked hard and fast to adapt ourselves in response to market needs. Our great fortune was certainly the fact that all main company processes were directly supervised by one of the brothers, with well-defined roles and tasks: one brother was in charge of production, another of marketing, another of purchases, etc. All company processes were able to evolve and develop to their fullest under careful monitoring. Within a short time, the Carimate line was fully operational, with a production of 2 million sqm/year. Of these 2 million, 800,000 sqm were shipped to southern Italy, where we had very high demand. This, together with the far from negligible transport costs we incurred, led us to invest in Calabria and, more precisely, in the province of Crotone. 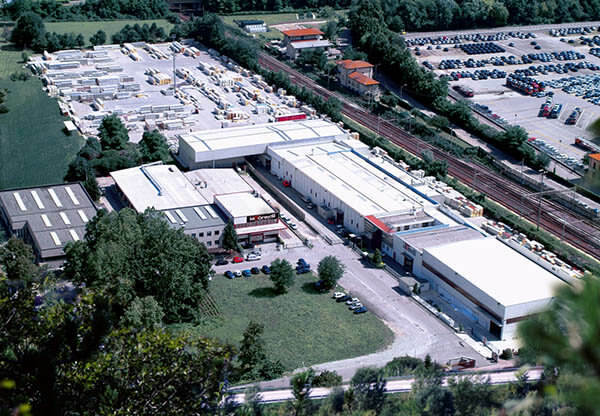 In 2000 we bought the land, built the warehouse and installed a new plant: Koper spa, the second production centre of Lattonedil, was established. Strengthened by the experience gained with the Carimate facility, the Crotone plant was built with leading-edge criteria, which enabled us to achieve an optimal layout of the building and storage area. The Crotone plant is still modern and very functional today. In 2003, with the aim of providing an additional service to the customer – that is, providing roofing panels and wall panels at the same time – the second line was installed at Carimate. The speed of delivery times was a great competitive advantage for us which, even today, represents a distinctive characteristic of our service and a reason for the success of our companies. In 2008 we completed the Carimate facility with the third line dedicated to the production of roofing and bent tile panels, a product that was missing in our range. In the same period, we opened a new facility in Venzone, in the province of Udine, specialised in the production of panels with mineral fibre, glass wool and polyurethane insulation. 2012 was the year of the Dinkelsbühl site in Germany, a site created for the northern European market, and the purchase of 50% of Panelais of Huerta, Salamanca, Lattonedil's window on the Spanish and Portuguese markets. 2016 was instead the year of Nova Topola, in Bosnia: a specific strategic decision, since in this country, which is outside the European Union, you can freely purchase steel without having to bear the hefty duties applied today in Italy. The plant is reaching full production very quickly and projections see it settling to 2 million sqm. Within the current year. A great result. The production site of Nova Topola, Bosnia and Herzegovina. What are the factors leading to the choice of a specific area where to open a new plant? The demand trend and the analysis of transport costs is always the basis. The parent company of Carimate keeps the sales and volumes of the various areas under control and reports interesting trends detected in the area. Market surveys are performed, we hear from our local agents, we consult the suppliers and the various contacts on site. The choice is never left to chance, it is always the result of a strategy and of a thorough assessment. Have you followed the ‘call of demand’ also for the new plant you are about to open in France? Absolutely! In France, we sell approximately 700,000 sqm of panels a year. La Roche-sur-Yon, the town where we are building the new facility, is located in the north-west of the country, near Nantes, in a rather industrialised area, characterised by strong growth in construction and where, within a radius of 400 km, it seems there are no competing companies. As for the other sites, here too we have purchased the land and built the warehouse that represents a real-size sample of what the customer will be able to do with our products. As in the facility built in Germany, approximately 8,000 sqm of Solarpan® Plus roofing panels will also be installed at the production site in France, in view of the subsequent installation of photovoltaic panels. Project of the French plant Roche-sur-Yon soon to be opened. In the span of 50 years, Lattonedil has become a group with 10 production facilities, 6 in Italy and 4 in Europe. All lines are fully operational with a production of 2 million sqm each. Can we say that the panel market of Lattonedil knows no crisis? The history of the Group says so. But one should not believe that continued presence on the market and success come from nothing. Every step forward has been a conquest, the result of great work and great attention to all company processes and everything there is around them. For example, personnel. I have always reserved special attention to people. Having started my working career in the production department, I know very well how much effort and attention is required when working on systems that are operating round the clock, and I understand when an accident was inevitable or could have been avoided with more attention. At a speed of 12-15 metres per minute, a simple oversight is enough to cause very serious damage. It is a job requiring great concentration and therefore care for people. Our success is the result of great commitment, attention and determination for continuous improvement. It takes little to lose the competitive edge you have earned. Attention to innovation something you perceive the moment you enter the company. A very captivating video welcomes visitors and tells us about one of the latest products that you have launched on the market, the flat roof panel. How much did innovation affect, and still affects, your growth strategy and how is the impulse towards a new product born? Innovation is certainly one of the main factors of our success. Having innovative, exclusive products is a competitive advantage, it allows us not only to expand our offer but also to provide more attractive prices. Many of the solutions offered are the result of experience gained as installers. We have seen the customer’s needs first hand. We are good at interpreting the market and understanding its signals, this is where we begin to study and introduce the innovative element. For example, a few years ago we launched the Solarpan® plus panel on the market, a system that allows, in a short space of time, to assemble the photovoltaic panel, without the need to change or drill the roofing and remedying problems due to infiltration. Only Lattonedil had this kind of solution, a real revolution. Although there are similar products on the market, Solarpan® plus is still in great demand today. The flat roof panel shown in the video is a product that has just been launched. An innovative, highly technical product that was missing on the market. This is the TTACK® panel, a patented product unique in the world that allows for lower costs in the structure by changing the roofing from tilted to flat or by increasing the internal volume, energy savings coming the recovery of unused volume and time saved thanks to easy installation with the specific snap joint that, among other things, forms 2 natural safety channels for the water to flow. The launch has been positive, we have orders already both in Italy and abroad. In your opinion, why does the use of panels in the residential sector still account for low figures? Are there any signs pointing to a turnaround? There are various opposing factors that depend on aesthetic factors, little knowledge, habits and even on hesitation by the manufacturers in offering new products. I think things are changing now: even in this field there is certainly more attention to energy savings and the trend is also supported by a legislation that requires greater insulation in renovations and new buildings, where the insulation lambda must have specific values. As a result, the average thicknesses are increasing. Furthermore, we are thinking of implementing insulation of walls as well. Up to 10 years ago, no-one paid particular attention to it, now even market experts expect it to growth and this not only with regard to renovations in warehouses, but also with regard to the walls of our homes. Personally, I reckon that a few years from now we will see a good development. I am optimistic about it. Even a few years ago with the housing crisis and flats that were not selling, the panel market did not stop, instead our sales increased. Cement underwent a crisis, but panels didn’t. I believe this supports my thesis. For your latest project – the Roche-sur-Yon plant – you have chosen to use DOW for chemicals and SAIP for the production line. What are the factors that guide you in choosing your partners? In Lattonedil we have made continuous improvement our mission and to continue to grow, we need the help of real experts. I have known Dow and Saip for several years and I know how they work. I believe that their experience, know-how and approach can provide us with the technological support we need to achieve our goals. For the development of the France project, we needed immediate and suitable answers and both companies confirmed that they were up to the task. The Dow Polyurethane Systems have always maintained high quality levels over time. Even when they offered us innovations, they have always sent us fine-tuned products that never disappointed us. Using a new product without complications for production, such as stops or scraps, is really crucial. I have known Saip for years and I have been able to appreciate its growth and continuous technological evolution. Namely, for the design of the France line, I really appreciated how our requests were taken care of. The line is designed to produce roofing panels, wall panels and the hidden fixing panel. The latter is a particular panel, in demand in France, specifically by architects. The type of panel that was requested by the market and the technical aspects of the panel we were going to create were decided together. Together we designed the product and found the solution to manufacture it. We have designed a plant perfectly tailored to our needs. The result will be exactly what we have set ourselves to achieve. One of the determining elements of this project was certainly the presence of cedepa (www.cedepa.org), the research and development centre of the panel that the two companies have founded as a joint-venture in Spain and more precisely in Zaragoza, where I have been several times. Cedepa provides us the guarantee that new compounds will be tested in real conditions, on a complete real line and not only in a laboratory. The product is perfected, with no unexpected issues. In cedepa I can perform useful simulations and push myself a bit further, without the risk of compromising normal production or jeopardising my equipment. For us, Cedepa is a perfect synergy between chemistry and mechanics for strategic innovation. Extremely useful. 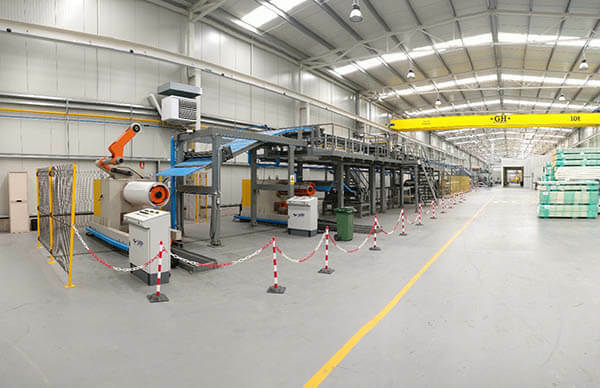 cedepa – the sandwich panel production line. And after France? Will you stop or are you already assessing the options for another company? We are not made to stand still. The next step will be to expand the Carimate facility, specifically the panel storage area. Additionally, unlike in other sites, Carimate does not have chillers, therefore we want to build a designated warehouse for panel cooling systems in order to streamline the process. We have many, many projects in mind, a whole day would probably not be enough to list them all. In the next few years we are counting on developing more, also thanks to our children joining the Lattonedil group. They have brought the same enthusiasm and commitment that the 5 of us shared when we embarked on this wonderful adventure. with Luca Profili of Dow The Chemical Company.